Since W is going to daycare in the afternoons these days, he’s going to need some valentines to take to school with him. I’ve looked at all of the boxed valentines and spotted some he would like. But I have been feeling the urge to me some DIY Valentines for Kids. I know I’m not the most crafty of moms. But I really want something special for his very first valentines. Not that 2-year olds care but… still. 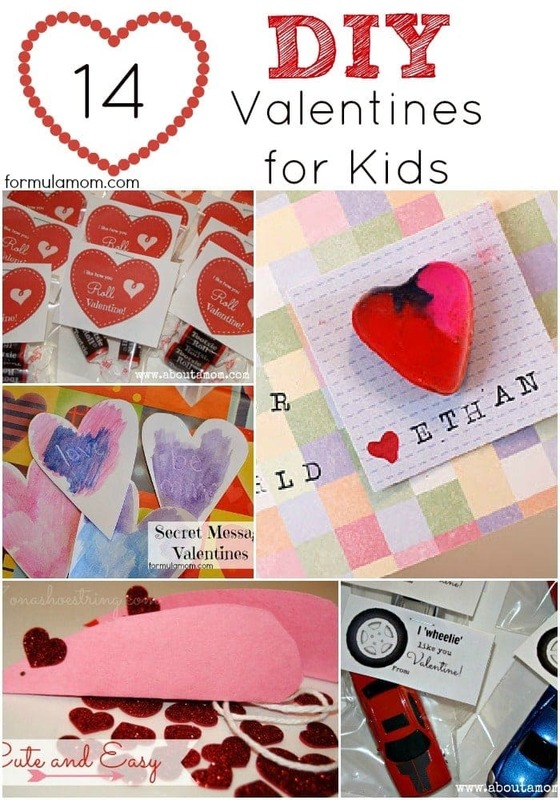 I haven’t made anything yet, but I did go on the hunt for some inspiration and found these 14 DIY Valentines for Kids. I’m pretty sure that I might be making some lollipop mustaches this year. Imagine the photo opportunities! So adorable! And I did make some DIY Valentines although I don’t think I’ll be letting W take them to school. But we’re in love with our DIY Heart Rocks! Now on to some more great ideas! I’m thinking I may buy a bag of tootsie rolls and use them. Or I might get crafty and make my own using PicMonkey if I can get inspired. Danielle at Simmworks Family Blog shared a great tutorial on how to Make Valentines with PicMonkey that has me wanting to my hand at my own creations. Even if I end up buying valentines at the store, I just love these ideas. I love the personal touch these add to a holiday that can be a lot of fun for the kids! What kind of Valentines will your kids will be handing out this year? Check out all of my ideas for Valentine’s Day treats and crafts! Hi there. I just sent you an email but realized this might be better. How Can I be apart of your lovely Valentines Day DIY collection ( if you plan on doing another one that is). Here is a link to post I just did today for Valentine Rice Krispy Treats. Thank you so much for including my Thumb Print Valentines in your round up. It was so sweet to be included!